I am ashamed to share what I have done. Never before have I taken part of an online wine tasting event that made even myself, the self proclaimed "Wine Whore" blush. Before I get into the gory details, let me just state for the record that I would not be doing my job if I didn't tell people about these types of happenings. I will leave out names so as not to implicate others and will only mention facts so you may get as unbiased of a description as possible. While I am afraid that there will be some people who will take offense to this post, I encourage everyone to direct their negative energy towards changing these types of wine events for the better. Four wines from one winery were selected. Participants were given the option to purchase the chosen wines prior to the event. Many bloggers (myself included) were shipped the wine for free. Participants were told to sign on to a website at the time of the tasting. The website provided a status feed allowing participants to tweet and read twitter status updates from other participants. During the event four wines were to be opened, tasted, and tweeted about. Tweets were simultaneously published to the website as well as the internet. The website that we were to log on to was broken for a good portion of the tasting. There was little or no info provided about the wine being tasted. The website provided a live feed where you could watch people eating food while they drank the wine... no audio, no conversation, nothing. Just people eating food and occasionally waving at the camera. Yes, I see you... I'll tell your mom you said hello. Amongst the flood of praise and glory about the wines being tasted, there was nothing constructive to say about the wine. Due to the lack of coordination and malfunction of the website, I missed the opening of the first bottle. I opened the second, took a pour, and was not impressed. Then I looked down to find all of the other tasters hooting and hollering in it's praise. Was I the only one who didn't enjoy the wine? Did anyone have anything constructive to ask or say about it? The worst part is that all of the seemingly brainwashed praise was being broadcasted out to the internet. Would people out there listening to us "wine gurus" be convinced that this wine is the next "god juice"? I know if I was watching I would have run right out to the closest wine shop... only to be disappointing in what I was tasting. The winery should have been online and ready to take questions. Adequate information about the wine should have been provided prior and during the event. Tasters should have been encouraged to describe what they like AND dislike about the wines. I believe that by conducting an online tasting event in the manner I just described, not only do wineries gain publicity, but wineries can actually learn how to make their wine better. While the event that I took part in may help convert some sales and move some bottles, it will also create dissatisfied customers. 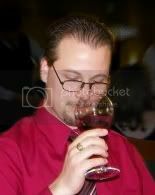 By not providing the full picture about the wine being tasted, you may cause people to never trust your taste your wine again. That's not a sale that I would be willing to make. In the end, it comes down to whether or not you are interested in a long term marketing strategy or just a quick boost in sales... you decide! Personally, I'd rather drink with people who want to share the good and the bad instead of just trying to convince me that everything is good. That's just me, maybe I'm not considering those people out there who feel that they should be told what to drink. Once I realized what was going on, I left the event. After all, I may be a whore but that doesn't mean that I don't have standards. That's too funny. I noticed the hastags the other night on FB with a mention to you and looked to see what was going on. Sounded (through tweets) like they had some amazing food pairings, but when I got to the video stream and just saw people standing around a table...with no sound, I figured it was either a glitch, or something I needed to be invited too. I also didn't see any tweets FROM you so I figured it wasn't worth my time. LOL! Yep, that was it! I was so disappointed that I actually got upset. Ruined an evening that I was otherwise really looking forward to. B. Just because some one likes wine, and has a twitter following, does not mean they can pull off an event like this..
C. there is a big difference in quality between the national market,(which is what you have become)and thre 'local click market"
First of all, as someone who attended your event, I didn't see anything wrong. In fact, I had a great time, got to use some things that I had wanted to try, and most importantly, got to drink some great wine with some tasty food. I felt like I definitely got my money's worth out of the event. My wife and I would love to go to any other event you plan. Never participated in an on-line wine tasting event. Now I don't know if I would. I was kinda surprised by the fact that most if not all of the people that were taking part in the event were people that I respect in the wine community. It was a real eye-opener for me. Shall I ask what wine it was? Honestly, I would mention it if it would add anything to the discussion but in this case I don't think it would help anything. Based on what you said, it does not seem like it was a good online tasting event. I have participated in a number of other online tasting events, many good, but some which just didn't do it right. Wineries & PR people should be checking the successful events, and trying to emulate the good parts. I agree that someone knowledgeable about the wines should participate in the event, to answer questions about the wine. They should provide info about the wines prior to the event as well. And a live feed of people eating seems so silly. It really seemed like I was the only one who felt this way... little surprised. I did an event a little while back with Chalk Hill that went much better. Of course there were some technical difficulties, but overall I learned a lot. I was able to ask questions to the winemaker and actually hear her thoughts as we tasted the wine together. It was less of a marketing event and more of an informational event.... now that's what I would like to see more of!